My good friend Melissa told me about these Chocolate-Covered Cherry Cookies she discovered from her coworker. Her description alone was enough - I had to make them. 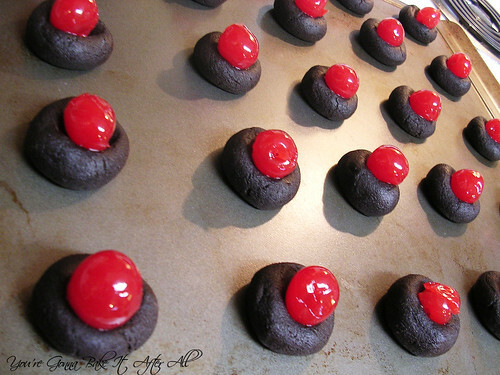 Bob and my dad both love chocolate-covered cherries, so I knew these cookies would go over well with them. I was surprised by how much I liked them - they are fantastic!!! The cookie part itself is so good, I would be happy with those alone, but the cherry-chocolate glaze is amazing, and I actually enjoyed the maraschino cherry (which I typically don't eat). 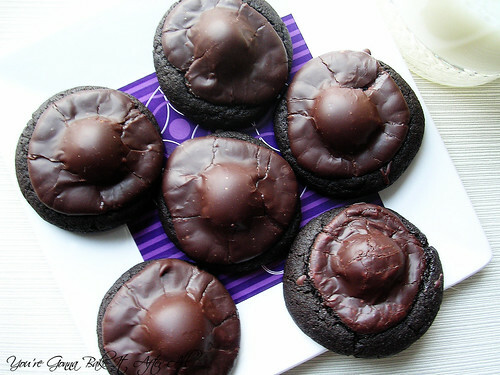 I used dark chocolate cocoa powder and bittersweet chocolate for the glaze to make these Dark Chocolate-Covered Cherry Cookies, but you can certainly use semisweet or even milk chocolate. I made these cookies for Christmas so I decorated half of them with Christmas sprinkles, but these cookies would be great for Valentine's Day. They would look so cute with some heart-shaped sprinkles! 1. In a large bowl, combine flour, cocoa powder, salt, baking powder and soda, blending well; set aside. 2. In a mixing bowl, beat together butter and sugar on low speed until fluffy. Add egg and vanilla; beat well. Gradually add dry ingredients to the creamed mixture; beat until smooth and well blended. 3. With hands, shape dough into 1-inch balls; place on ungreased baking sheet. Press down center of dough with thumb. Drain maraschino cherries well, reserving juice. 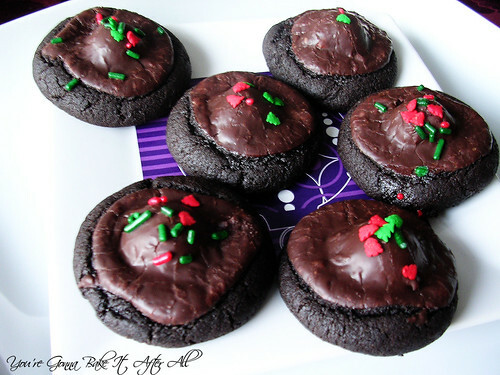 Place a cherry in the center indention of each cookie. 4. In small saucepan, combine chocolate pieces and sweetened condensed milk; heat on low until chocolate is melted. Stir in 1 tablespoon plus 1 teaspoon of the reserved cherry juice. If frosting seems too thick to spoon over cookies, thin with a little more cherry juice. 5. Spoon about 1 teaspoon of the topping over each cherry, spreading to cover cherry. 6. Bake cookies for 10 minutes, or until done. Remove to wire rack to cool. Store in airtight container. I made these with Christmas sprinkles, but they would be perfect with Valentine's Day sprinkles or with multi-colored sprinkles for anytime! Wow, lovin' this idea! This looks amazing! As an official taster, I gave this one a thumbs up, too. I can only imagine how delicious it would be to bite into that with so much chocolate flavor. They sound like a great cookie. I'm starting a new linky on my blog this Saturday called "Sweets for a Saturday." I'd like to invite you to come by then and link this up. Oo I just made some Dark Chocolate Cherry cupcakes the other day--two great (hungry haha) minds think alike!!! I found you via Stef Pollack at The Cupcake Project, and thank goodness I did! I am positively drooling over your sweet treats!